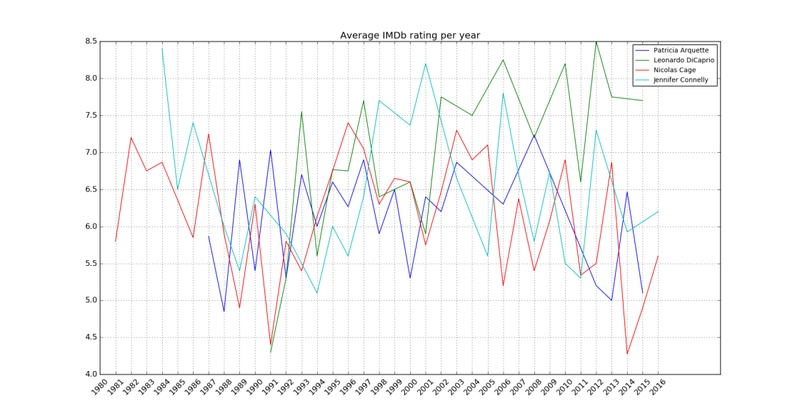 In the previous post (Playing with IMDB, Python and Pandas), I tried to obtain the average IMDb rating of an actress. This time I’ll play with matplotlib in order to plot the evolution of an actress over the years. The code is quite similar to the one shown in the previous post. The modifications are related to filtering roles in TV series (removing multi year roles) and grouping the rating by year. The code below shows the calls for getting the DataFrames with the years and the ratings, and the matplotlib setup for plotting the progress of the actresses.